Fall is by far my favorite season of the year. Although it's insanely hot in L.A. right now, all I can think about is coats, sweaters and boots. Boots are a major part of my fall/winter wardrobe, so I thought I'd put together a list of the 5 styles I'm loving right now. Personally, I'm dying for a pair of moto boots. What boot styles are you currently loving? Gorgeous - all of them. I like the rain boots and the heels the best. How about you? I need black boots urgently!! I loooooove boots. They are my favorite fall fashion statement. Love the buckle chunky heel boots! 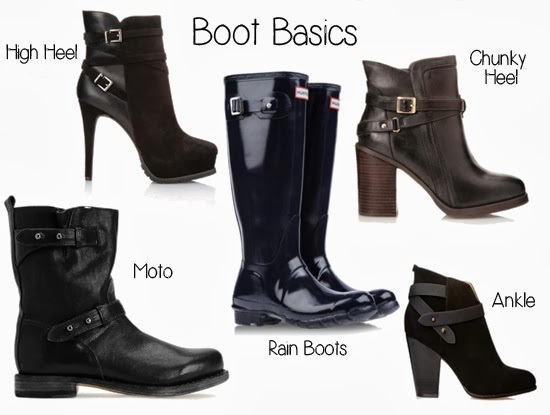 My favourite for this season is definitely the moto boot. I spend a lot of time on my feet and this is a great boot style for me.